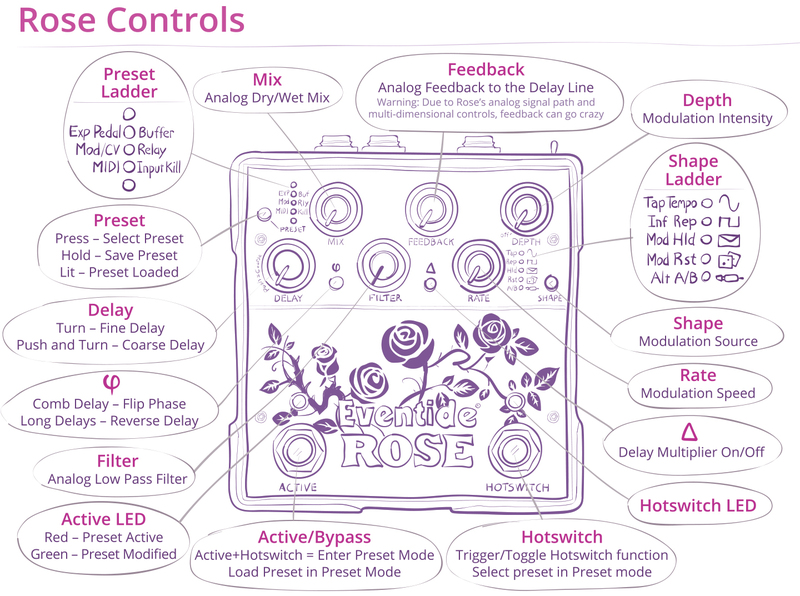 Rose is a modulated delay like no other. 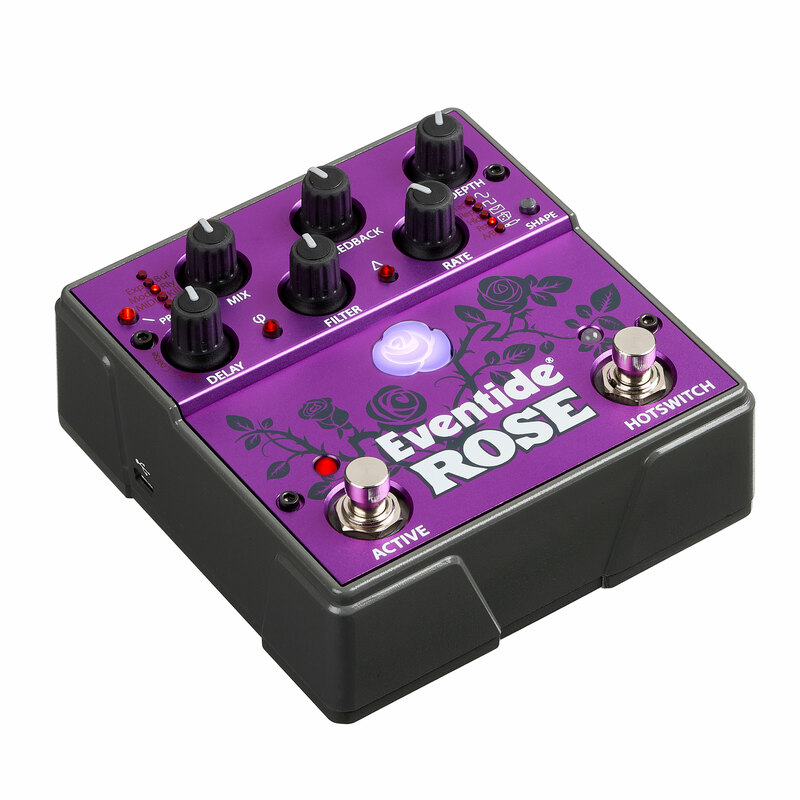 From reverse delays, slapback, chorus and everything in between, Rose is capable of producing a wide range of sounds. The perfect hybrid of analog and digital, the pedal features five different modulation sources, delay multiplier, phase invert/reverse, five customizable presets, true analog dry path, MIDI, and AUX/Expression via TRS for ultimate versatility, on stage or in the studio. Rather than effects running on a DSP chip, Rose is a simple, pristine, super-modulated digital delay combined with all analog circuitry bred for mixing, filtering and feedback. The sound is exquisite and the range of effects wide. Preset 1 is both a shimmery Chorus and lush Leslie. The Hotswitch is assigned to A/B which allows you to switch between A: Chorus and B: Leslie. The Chorus setting enhances notes and chords with a rich 3D quality. It utilizes a short delay (2nd LED from bottom-coarse adjustment/fine adjustment between 10 and 11 o’clock) with the mix at 3 o’clock, the filter a little past 1 o’clock, the feedback a little before 12 o’clock, the rate at 1 o’clock and the depth between 1 and 2 o’clock. The shape ladder is set to random which gives a wider spread and provides a warm thickness. The Leslie setting turns your instrument into an instant organ and brings forth a classic rotating speaker sound. It utilizes a short delay (2nd LED from bottom-coarse adjustment/fine adjustment 7 o’clock) with the mix at 3 o’clock, the filter at 12 o’clock, the feedback at 8 o’clock, the rate at 2 o’clock and the depth at half past 2 o’clock. The shape ladder is set to sine which produces a perfect warble for organ emulation. Preset 2 is both a smooth Lead Delay and Psychedelic Reverse. 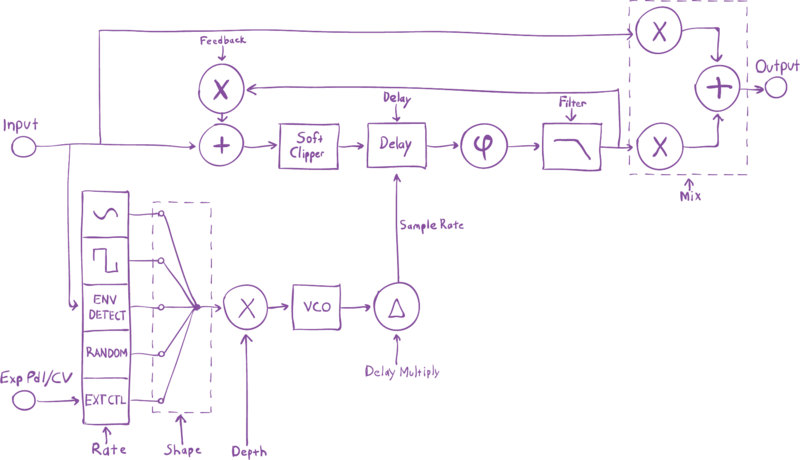 The Hotswitch is assigned to A/B which allows you to switch between A: Lead Delay and B: Reverse. The Lead Delay setting is designed to make solo playing soar. It smooths out single lines, makes chords full and adds just enough delay to the mix to provide the finishing touch to tonal nirvana. It utilizes a medium delay (3rd LED from bottom-coarse adjustment/fine adjustment between 12 and 1 o’clock) with the mix between 10 and 11 o’clock, the filter at 11 o’clock, the feedback at 11 o’clock, the rate a little before 11 o’clock and the depth just before 12 o’clock. The shape ladder is set to square which makes the modulation more present in this particular setting. The Reverse setting is psychedelic euphoria: readily create swirling swells from another dimension. 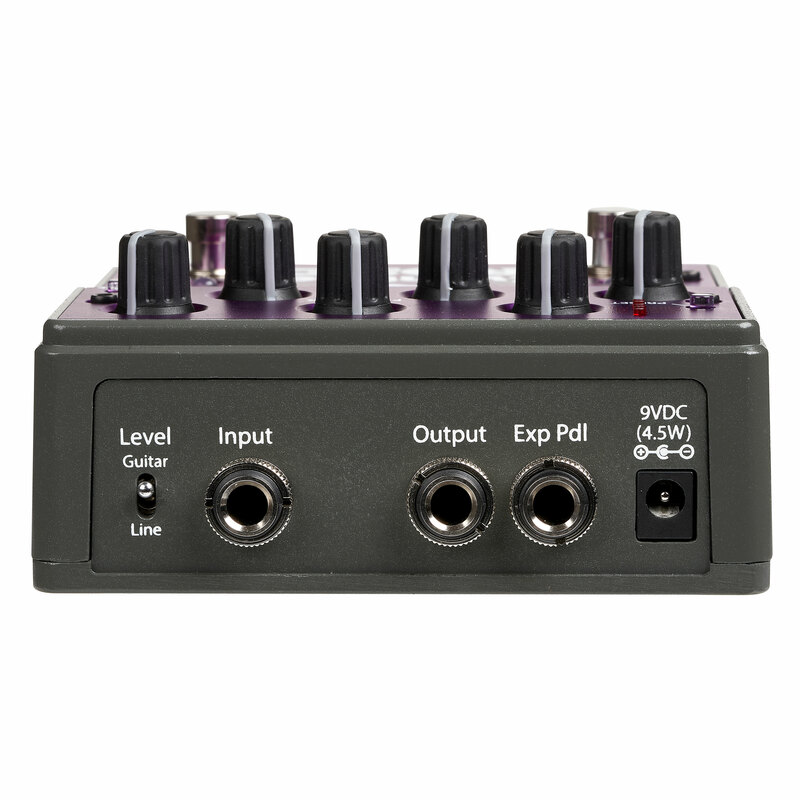 It utilizes a medium delay (3rd LED from bottom-coarse adjustment/fine adjustment 2 o’clock) with the mix fully engaged, the filter a little past 12 o’clock, and the feedback, rate and depth all at 0. There is no modulation occurring on this setting. The phi button is engaged which produces a reverse effect in longer delay settings. Preset 3 is lo-fi delay that utilizes the Delta Multiplier to reduce the sample rate. In this case it alters the sample rate by 4x. (Hold down Delta Button and use shape to scroll down to the 3rd LED (4x) on the Shape Ladder). The Hotswitch is assigned to tap tempo which allows you to readily change delay times. Plug in an expression pedal to get the most out of this preset. In heel down the delta multiplier is engaged and in toe down the delta multiplier is disengaged. The change between parameters occurs halfway through the sweep. 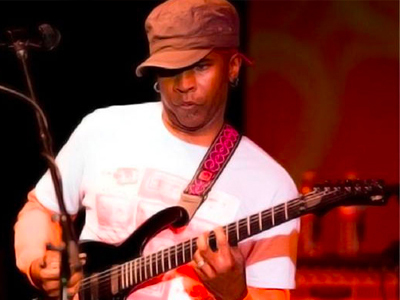 This allows for whammy like crystallization effects as the sample rate is being continually manipulated with each sweep of the expression pedal. This setting utilizes a medium delay (3rd LED from bottom-coarse adjustment/fine adjustment at 12 o’clock) with the mix at 9 o’clock, the filter at 0, the feedback a little after 3 o’clock, and the rate and depth all at 0. There is no modulation occurring on this setting. The shape ladder is set to random which gives a wider spread and provides a warm thickness. Preset 4 is both a snappy slapback and frenetic filter that causes a devilish diminished descent depending on the dynamics of your playing. The Hotswitch is assigned to A/B which allows you to switch between A: Slapback and B: Frenetic Filter. This setting is a classic slapback that makes notes pop. It utilizes a short delay (2nd LED from bottom-coarse adjustment/fine adjustment near 12 o’clock) with the mix at 12 o’clock, the filter at 11 o’clock, the feedback at 10 o’clock, the rate at 1 o’clock and the depth is maxed. The shape ladder is set to envelope which is a low pass filter. 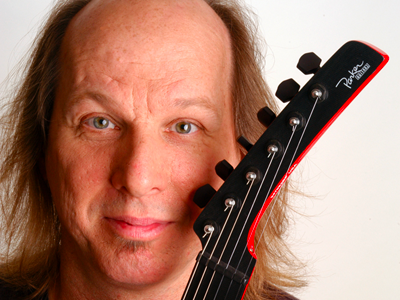 The Frenetic Filter causes outlandish diminished arpeggio dives depending on playing dynamic. The harder you play, the quicker the descent occurs. It utilizes a short delay (2nd LED from bottom-coarse adjustment/fine adjustment at 1 o’clock) with the mix at 11 o’clock, the filter just before 12 o’clock, the feedback just past 1 o’clock, the rate at 4 o’clock and the depth is maxed. The shape ladder is set to envelope which is a low pass filter. Preset 5 gives you the ability to capture something you’ve played and pitch it infinitely to create wild soundscapes. The Shape Ladder is set to external which allows you to control the modulation by either manipulating the rate knob or using an expression pedal. The Hotswitch is set to Infinite Repeat which will hold whatever is played when the Hotswitch is engaged until the Hotswitch is disengaged. This setting utilizes a medium delay (3rd LED from bottom-coarse adjustment/fine adjustment between 9 and 10 o’clock) with the mix at 1 o’clock, the filter a little past 9 o’clock, the feedback a little after 12 o’clock, and the depth maxed out. The rate is swept from 0 to maximum to provide pitch fluctuations. When delay is adjusted, the Preset LED Ladder indicates the delay range. Push and turn the Delay Knob to select one of ten delay ranges. 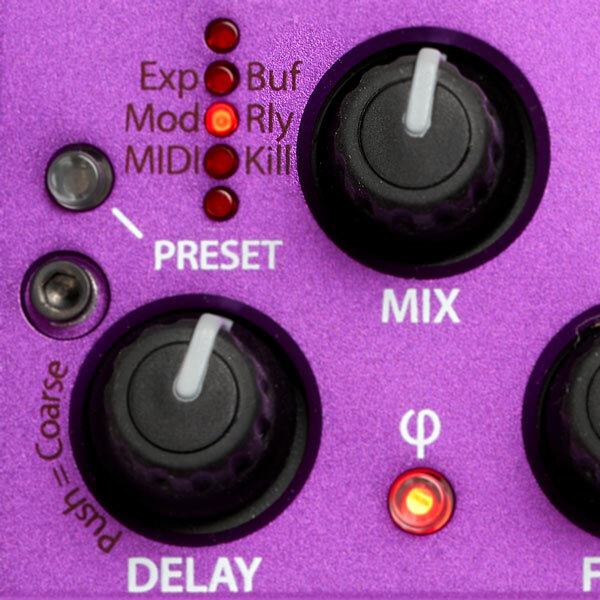 Turn the Delay Knob (w/o pushing) to fine tune delay within delay range. "The Rose is just like my FLUX app: it has endless possibilities and the sounds are fabulous! Be prepared to spend many happy days of discovery." "Do you remember the Smoke Monster from Lost? 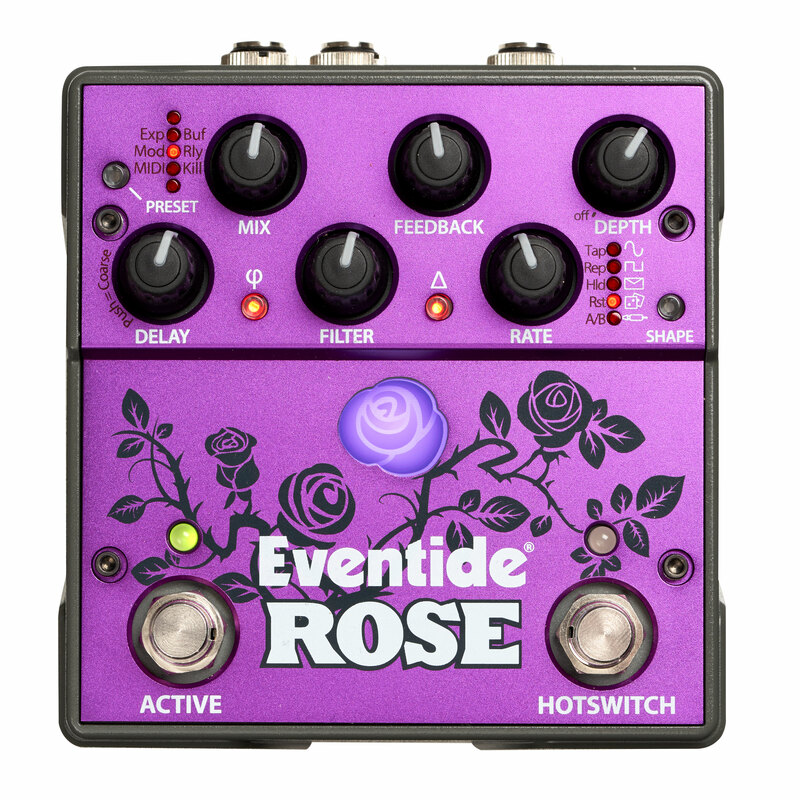 Eventide’s Rose is like that, only much more fragrant."